In this week’s Grocery Great segment, guest writer ForXx finds the best store-bought chicken for homemade chicken salad. As the temperature rises, hovering over a hot stove or grilling by the pool are not where I want to be. 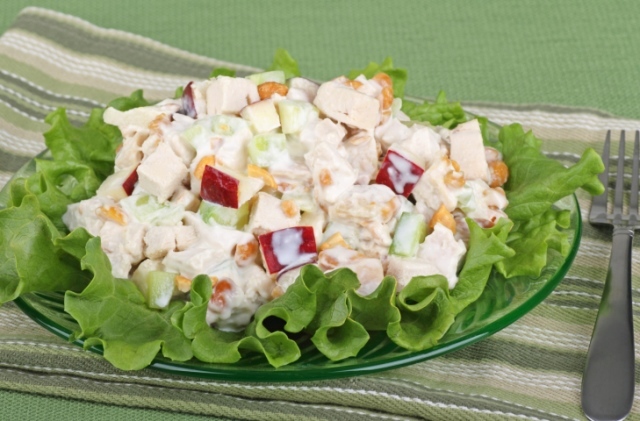 I love chicken salad and wanted an option that could not only be served as lunch but a light dinner. The key to a perfect chicken salad is, of course, the chicken so finding it was my first priority. I wanted a chicken breast that didn’t taste store-bought but rather like I grilled it myself. My options were either too soggy, tough or chewy, until I found Tyson. From the bag to my bowl, this quick chicken salad recipe is perfect for a refreshing mid-day snack or filling enough for an evening meal. The key to a good chicken salad besides the chicken is the texture. There should be a balance of crunch, flavor, mildness and richness without a thick mayonnaise taste. Try using vegenaise, made with no eggs; it’s light and fluffy. Tyson can be found in the deli section of your local grocers. Mix in a food processor. Press the chop button til your desired consistency is reached. Serve between slices of Hawaiian bread rolls or stuff an avocado with a gentle squeeze of orange juice. Best with ice cold water or your favorite beverage.